Students of any age love a good old fashioned Easter Egg Hunt so why not have them practice their Spanish reading and speaking skills at the same time? 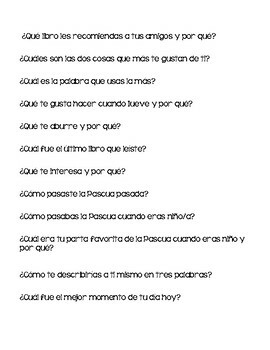 This product includes 25 Spanish questions in varying levels of difficulty. 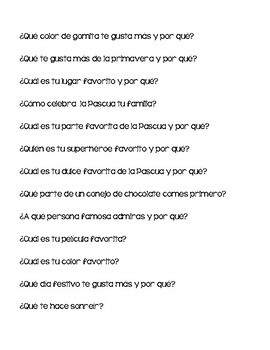 Some are about Easter and some are general questions meant to get students thinking and speaking in Spanish. 1) I teach grades 7-12 so I choose an egg color for each class (Eg. only students in 7th grade can find the green eggs). 2) Copy the question page, cut out the questions I want to use for each level and stuff the eggs. One egg per student. 4) Students are instructed to remain calm when they find an egg! Open it, read it, figure out what they want to say by the time they get to class. At the beginning of class they can answer their question and then I give them a little baggie of Easter candy. Every student has the ability to get one egg. Students help each other find them and answer them so everyone gets the candy. I keep track of where eggs are hidden, where they are found, and who found them so I know towards the end of the week where to find the extras and who to give hints to on where to find some.